Saint John on August 9-11 and August 16-18. Tickets are available through Heritage Park (Calgary) and Ambassatours (Saint John) or directly through TicketWeb for all locations. In Saint John, the train will depart from Long Wharf (near Harbour Station) and cross the Reversing Falls bridge to behind Moosehead Breweries, then come back for a total of 24 minutes. They start departing at 9 AM and continue until 5 PM, so there will be plenty of opportunities to ride or photograph the train. As far as I can tell, the host railroad provides the coaches and a diesel to do the actual work, and the Thomas engine provides the steam and photo opportunities. There will be plenty of other Thomas sights and activities at the site, including photo ops with Sir Topham Hatt™. Here are a couple of videos showing Thomas at work. The first shows Thomas in St. Thomas, Ontario. The second shows Thomas at the Gwili Steam Railway in Wales. He's smoking it up! EDIT: Added some more dates. After my noon shooting of the Canadian and other trains, I went back to work for a few hours. On my way home, I decided to take a spin around Wilkes Avenue to see if I could catch a train. Right away I saw a potash train heading east into Winnipeg but I didn't see the head end. However, I *did* see that a westbound train was passing it. I was able to catch up to the head end around mile 7 but I didn't think I could get my car stopped safely at Carman Junction, so I carried on to the next crossing and parked and ran back to catch it. This turned out to be CN 117. I got ahead of it and shot it on the open prairie just before Diamond. Watching it pass, I noticed headlights coming the other way - a meet! I jumped back in my car and headed to Diamond but I missed the meet by just a bit. Here's the other train at Diamond itself. Note the propane tank for the switch heaters. I headed back east, and decided to try a few pacing shots. Out of a dozen or so, two turned out OK.
For my last shot, I stopped at Hall Road and got them before the Perimeter. You can see the late afternoon sun was against me in this photo. It was a good end to the day. Thursday March 28 was a busy railfanning day. I went out at noon to see the Canadian and I ended up seeing a little more. First, I saw a short CP local rolling north on the La Riviere subdivision at Kenaston Boulevard. CP 8216 and CP 3132 were pulling some tank cars and cement hoppers from the local industries. They were quick about clearing the crossing so they didn't hold traffic up for very long. I went up to the Rivers subdivision around mile 8 and waited for VIA 1. After some time, I grew bored and headed west to see what might be out at Diamond. I passed the track gang that was hard at work replacing rails. They have been doing this for the past few weeks and look like they are just about done. Just west of Diamond, I found CN 316 sitting patiently on the north track, waiting for their light. 316 had three engines, SD70M-2 CN 8868, SD60F CN 5528 and GP40-2LW CN 9418. The Geep was a nice find for me, as I rarely see GP40s anywhere and in fact I've only seen eight of CN's GP40 engines. As I headed back east past Diamond, I saw VIA 1 coming quickly, so I grabbed this shot at the crossing just east of Diamond. Note one of the track workers on the other side of the Park car. I was heading back east, satisfied, when I saw a set of headlights coming. It was a westbound general freight train, and I shot it around mile 7. It had CN 5726 and CN 2187 for power and had a lot of wood products on board. The CBC is reporting that a coroner's report is suggesting changes to headlight regulations for trains. The corner, Kristyna Pecko, investigated the deaths of three teens in October 2010. The children were spray painting graffiti near a railway tunnel and apparently did not notice the train coming. I haven't seen the report, but the CBC says it recommends not dimming headlights for oncoming traffic (Canadian Rail Operating Rules rule 17(b)). It also recommends fencing for the area, and, according to the CBC, "The coroner's report also suggests that organizations create campaigns to make people aware of the dangers of railways". Hmmm.. like, oh I don't know, Operation Lifesaver? Being a parent, I have great sympathy for the family of the deceased. I can't imagine losing one of my children, especially to a totally preventable accident like this. It is clear the children were in a place where they should not have been, and fencing likely would not have prevented them from doing their vandalism. I found this article where Montreal-area "graffiti artists" were interviewed after the incident. I really want to read this report. I looked for it but I don't read French well enough to find it, if it is even available online. Bottom line: Stay off the tracks and do not trespass. It's just not worth it. Thursday, March 14 was "PI day" (3.14). I went out at noon to try to get the Canadian at Portage Junction in Winnipeg. I saw CN 7044 and CN 1435 working Fort Rouge yard. They were likely the "local" train gathering cars before working the Fort Garry area. CN 7044 is equipped for remote control and the crew were using that while shunting. While I was watching them, CN 2256 came rolling up on the south track at the head of CN train 199. They stopped with 2256 halfway around the curve at Portage Junction. I realized this was going to block my view of the Canadian, now imminent, so I went to my car and headed over to Waverley Street to get them there. I was about a minute ahead of VIA 1 and got the shots. Kokanee Park was on the rear of the Canadian. I saw them pass through St. James Junction and there was a CN train stopped on the south track near the golf dome. The headlight was not on, indicating the train was unoccupied. CN 199 was going to be there a while, I guess, as the engineer was out enjoying the view from the "front deck". I went over to see the parked train. It had CN 8844 and CN 8012 ahead of this engine, faded CN 4761. Here's a slide I've been meaning to scan for a while. It shows CN 6765 and CN 6633 in Toronto at Union Station at an unknown location on August 9, 1975. The photographer is unknown to me. I've been trying to nail down when CN 6765 was repainted into VIA colours, and also when it lost the CN on the nose and gained the VIA. I'm slowly narrowing it down. EDIT: Thanks for the location information! EDIT2: I found a reference to VIA 6765 on Railpictures.ca where it says 6765 had a yellow pilot in November 1976. See the comment to this photo. There's also a reference here that says 6765 was the last FPA4 in green and gold, in 1965. My railfan friend Bob Liming came up from South Carolina to ride the Ocean from Montreal to Halifax and back in late February. He sent along some photos and information about his trip. Soon after leaving Montreal, one of the Chaleur sleepers developed a wheel issue and had to be set off at Drummondville. You may recall that the Ocean and Chaleur are together until Matapedia, where the Chaleur separates to head north. Here's the consist: Engines 6419 and 6439; Baggage 7003; Coaches 7220; 70217, and 7231; Service Car 7309; Dinner 7401; Service Car 7308; Sleepers 79515, 7518, 7506 and 7513; Transition Car 7601 and Skyline car 8312. Bob said the crew was quite concerned about the prospect of CN abandoning most of the northern New Brunswick line. Here is the train in Halifax. A wider shot shows the hotel to the left and the former VIA Maintenance Centre to the right. On the return trip, they were delayed about 10 minutes in St. Lambert, Quebec because the steps would not retract on one of the Renaissance coaches. Bob took the opportunity to photograph scruffy CN 4773. Here's a Corridor (HEP-1) train in Montreal, I believe. Thanks for the photos and information, Bob! 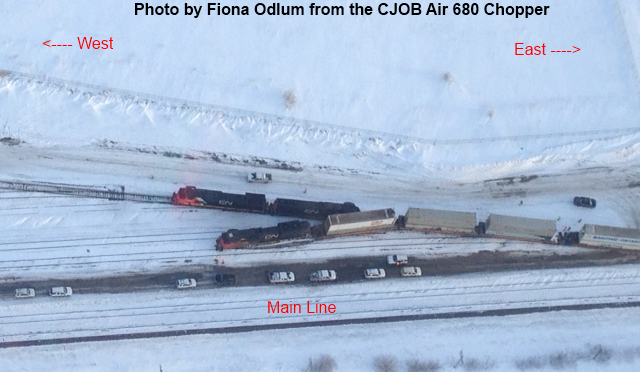 On Thursday, March 7, CN had a small derailment in their Transcona yard in Winnipeg. The lead engine and first car of westbound CN 115 derailed while coming into the yard, blocking the CN Redditt subdivision at around 7 AM. The rest of the train blocked a busy street (Ravenhurst) and the east Perimeter Highway. 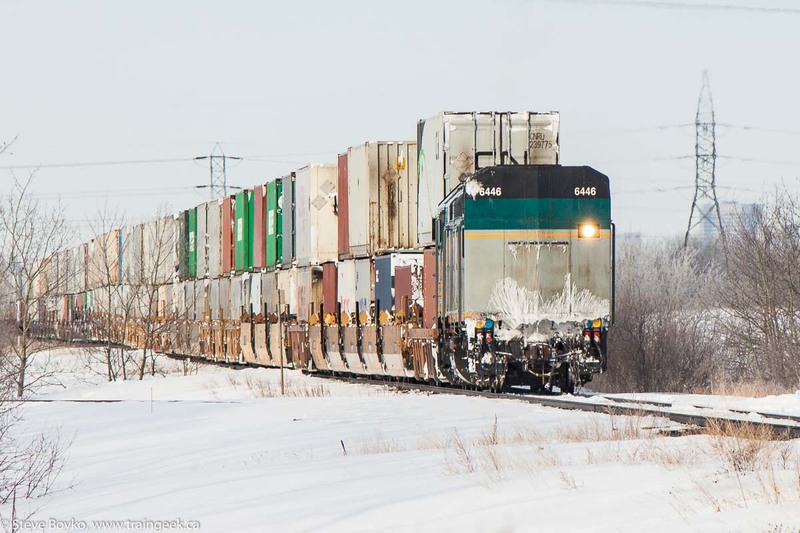 This also trapped VIA 1 and a couple of freights (CN 101 and CN 111) east of Winnipeg. Radio station CJOB 68 had their chopper in the air and took some nice aerial photos of the scene. From the photos it appears that there was a sideswipe but I am told it was a simple derailment. Perhaps the two CN engines (led by IC 2701) were there trying to hook on to the train to pull it into the yard. I believe the derailed engine was CN 8848. I drove up to see what I could see. I decided not to go anywhere near the derailment site, as the traffic would be crazy and based on the location I would probably not be able to see anything. I drove up Deacon Road to avoid the Perimeter and then headed out Dugald Road (route 15) toward Dugald. Very quickly I found VIA 1 stopped on the main line at Pineridge Road. The strange thing was that they only had one engine. When I was taking pictures, a taxi came up with a new crew and they boarded the train. There were six deadhead cars on the train. I guessed that the lead engine had been sent to help clear up the derailment scene, being the closest engine to the incident on the east side. I drove over to the Deacon Road intersection and sure enough, there was VIA 6446 on the end of a container train. I went to the crossing and watched them slowly pull the train eastward. Quite a pull for a single engine! Once they had pulled it far enough, one of the engineers dismounted to uncouple from the train. Once that was done, they headed east toward the Canadian. Note the EOT / FRED / ETD back on the coupler. They crossed Deacon Road and kept on going. I hopped back in my van and returned to the Canadian to catch them coupling up. Note the VIA Rail truck by the crossing. I was in New Brunswick last week, in the St. George area. 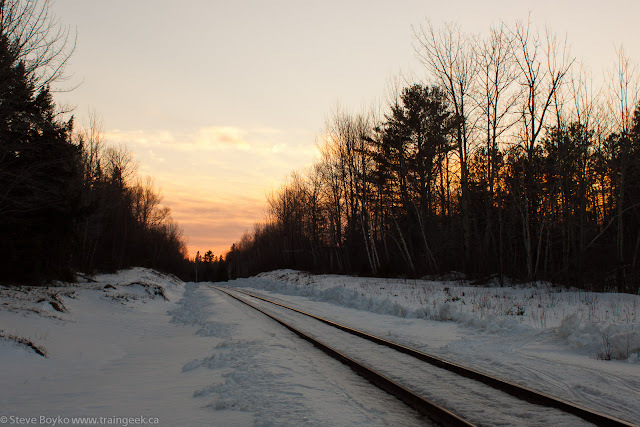 On Tuesday the 26th I decided I would take a run up to McAdam to try to photograph the station around sunset. It had been 4 years and 5 days since I had last been in McAdam - and that time I never even got out of the car! I set the GPS for First Street in McAdam and took off. Of course, my GPS had its own idea of how to get there. I had never gone to McAdam from St. George but I had a hazy notion of taking route 127 to route 3, but that's not what my GPS thought. 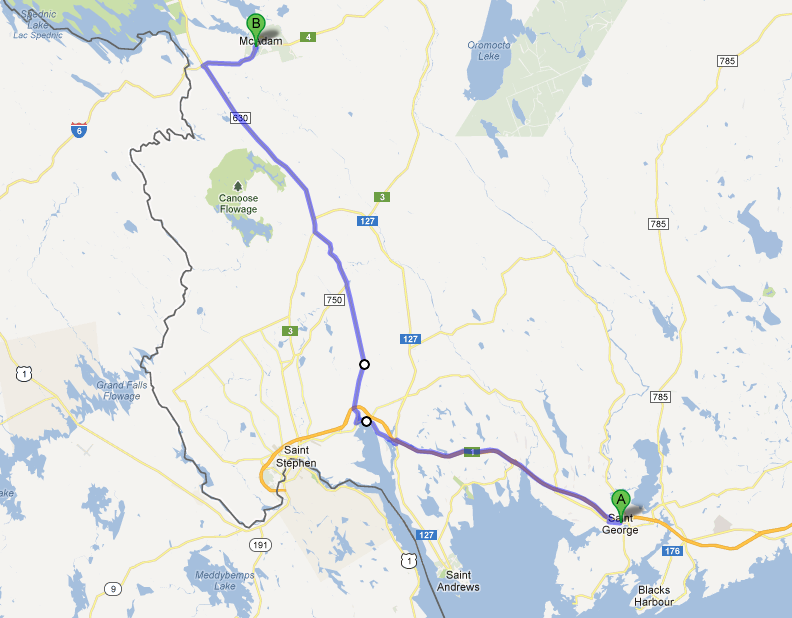 I spent a lot of time on route 755 through backwoods New Brunswick. All I can say is that I was glad it was still daylight! I'm pretty sure at one point I did a few kilometres on a gravel road. I crossed the St. Stephen subdivision in Honeydale, then encountered the McAdam subdivision at the intersection of route 4 and route 630. By this time the sun was pretty much below the horizon. This is facing west, toward the USA. A few more kilometres of driving brought me into McAdam. I spotted headlights in the yard and it turned out to be GMTX 209 and HLCX 906 (with caboose NBSR 434919) working the night shift. I've seen HLCX 906 before but GMTX 209 was new to me. The paint looks nice and shiny. They went down to the west end, out of my view from the station, so I took some stills of the station, then went for supper at Terry's. When I returned, it was totally dark. I shot a few more stills and this one was my favourite. The engines returned and did a bit of switching near the shop building. Gary got down from the engine and chatted with me for a bit. I did get a still of GMTX 209 at night and I like the headlight effect here. I hit the road for St. George after that, taking route 4 to route 3 then to route 1. No backwoods trips in the dark! Several news items (CBC, Winnipeg Free Press 1 2) came out recently about a proposed widening of Plessis Road in Winnipeg north of Dugald, and an underpass to go under the CN mainline. The city of Winnipeg and the province of Manitoba will each chip in about 1/3 of the $77 million cost, and an application has been made to the federal Building Canada Fund for the remaining $25 million. Now I see that the city is promising that construction is going to begin for an underpass this spring! Here's the city's information page about the project, or you can jump right to the PDF full of information about it. Here's the gist of it. At present Plessis Road has two lanes between Dugald Road (a main east-west road south of the tracks) and Pandora Avenue north of the tracks, with a level crossing over the two-track CN Redditt subdivision. You can imagine that the rail line is busy with a few dozen trains blocking the crossing each day. The city plans to dig an underpass (adding a rail bridge), widen two blocks of Plessis Road to four lanes, add some turning lanes on Dugald Road, and adding some sidewalks / bike paths. The project is projected to cost $77 million. Plessis Road will be closed during construction for a year and a half. CN will have to build a shoo-fly track running south of the current main line to divert trains around the construction area, much like they did for the Kenaston / Route 90 underpass construction several years ago. Personally, it doesn't affect me much since I don't live in the area but I'm sure residents will appreciate it. I still scratch my head and wonder why nothing was done when the nearby Perimeter / Dugald intersection was rebuilt a couple of years ago. There the same CN line (single track at that point) crosses the busy Perimeter Highway at grade and can potentially stop 100 km/hr traffic instead of the 50 km/hr traffic at Plessis. I'm puzzled by a lot of things that this city (and province) does and doesn't do.